An NTA-free, highly effective, highly alkaline cleaning concentrate based on renewable raw materials which reliably removes animal and vegetable fats, protein, aged wax and resin encrustations as well as charred residues and micro dust. 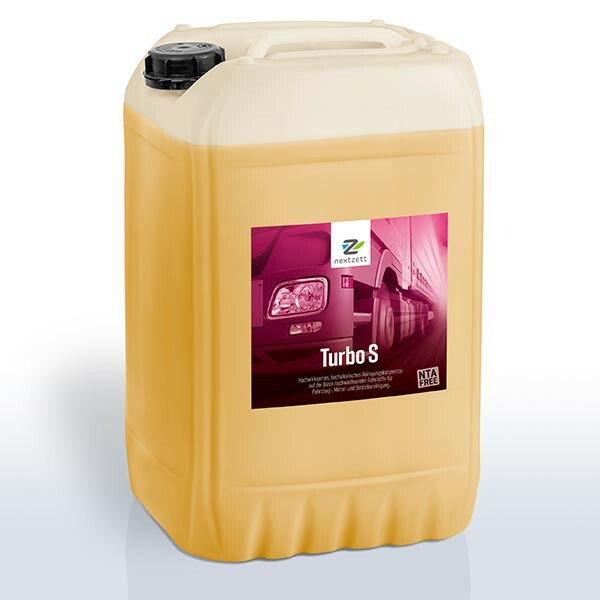 Turbo S can be used in several areas: eg pre-cleaning product of vehicles in automatic commercial vehicle and vehicle washing, insect repellant as well as tarpaulin and trailer cleaning, steam jet devices and for manual application in hand sprayers. nextzett Turbo S is an extremely fruitful, overbased cleaning concentrate based on nonionic surfactants, which reliably removes animal and vegetable fats, protein, aged wax and Harzverkrustungen and charred Rückst.nde and micro dust. The surfactants used are all readily biodegradable and behave in the waste water environmentally neutral. The organic complexing agents used are more than 90% biodegradable. nextzett Turbo S can be used because of its composition in several areas. For example, pre-cleaning products of vehicles for automatic commercial vehicle and vehicle wash, insect repellent as well as tarpaulin and trailer cleaning. nextzett Turbo S is suitable for use in all Vorsprühb.gen of commercial vehicle washes, steam cleaners and for manual application in manual spraying equipment. Important note: Before cleaning the beginning of a trial order, check compatibility. Caution should be exercised in the case of hot lacquer surfaces and sun exposure. Do not use too concentrated aluminum or alkaline-sensitive surfaces. Do not store in aluminum containers.